Hollyway has many years of experience and fabric care knowledge to protect your investment in your clothes. We utilize the highest end solvent on the market available known as GreenEarth cleaning. Clothes keep their colors and softness without fading, shrinking, pilling, or developing an odor. Delicate garments with beads and fancy trimming are cleaned safely. Hollyway Cleaners guarantees a ready to wear shirt with clean, crisp collars and cuffs with a professional finish that will make you look your very best. Our competitors use just one cleaning agent in the washing process. Our state of the art machines uses five different cleaning agents that result in bright, clean, and fresh shirts. Choose from no starch, light starch, medium or heavy starch. Every single shirt is expertly hand finished using European techniques and placed on hangers. You may also request folded shirts for travel or when you want to keep a spare in the office. Not every garment you purchase of the rack will fit you like it is was custom made. As full service tailoring specialists we offer the finest in alteration techniques that will help extend the life of your garments. Our highly trained staff works on everything from repairs on tears and snags, replacing zippers and buttons, original finish hems on those designer jeans, waistline adjustments, tapering and taking in shirts and jackets or any other challenges you can dream of. We can even do complex alterations on wedding and formal gowns. Just ask and we will see to it that your alteration requests are done with expert care. All tailoring jobs also include complimentary pressing. The rich and luxurious texture of suede/leather and fur are worth preserving. With professional leather/suede and fur cleaning we can give your garments many years of practical wear and enjoyment. You can trust our experts to preserve the color and texture of your favorite coat or jacket. Our brushing, glazing, and finishing techniques eliminate years of wear and distress and brings new life to the texture. For the furs we utilize specialized machines that protect and revitalize the luster and sheen of your fur. Entrust your treasured wedding gown to the professionals at Hollyway Cleaners and hold onto life's most treasured memories. With our special cleaning techniques and unique vacuum sealing process, our specialists guarantee their work to preserve your heirloom for generations.Preserve the memory of your special day. Allow us to save you the hassle of doing your laundry. Our highly trained staff will do it for you. We will separate light and dark clothes, use a premium detergent and softeners, and then neatly fold and package your items ready to just put in your drawers. What could be more convenient? We understand the importance of maintaining a clean household to remove allergens, bed bugs/mites, and dust in order to provide a healthy environment for your family. From comforters and duvet covers, to bed linens, sleeping bags, and coverlets you can trust our garment care specialist. Frequent and proper care will extend your bedding's life and provide a healthy home. Protect your valuable assets. 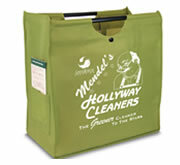 Each item is hand cleaned and shampooed inside and out with non-toxic, biodegradable products. In addition we remove stains, scratches are smoothed out, and apply leather conditioner. We specialize in high end bags made by the top brands Gucci, Fendi, Dooney & Bourke, Hermes, and Di0r. Be fantastic: use less plastic. We utilize state of the art equipment and European quality materials to do everything from shoe shining to complex full re-soling and heels and everything in between. They will Heel You. They will Save Your Sole. They will even Dye For You!